As Deacons share characterisitics of both Blue and Black Rockfish, I recorded them as Blue/Black Hybrids until 2015 when they were officially described by the scientific community. My last entry featured a Red Irish Lord. I noted this was the last “new species” I’d recorded in my paper fishing journals, and as of the time those journals were written, that was true. But as of August 27, 2015, the day after my 25th Birthday, I received a surprise gift in the form of science validating a new species I’d first caught four years earlier. I knew something was up. This fish was different. I’d learned to tell the difference between Black and Blue Rockfish, but this one featured characteristics of both fish. Though my first instinct was “Blue Rockfish,” it didn’t add up. First, the color was wrong. The body was neither blue nor slightly mottled as in all of the Blues I’d previously caught. 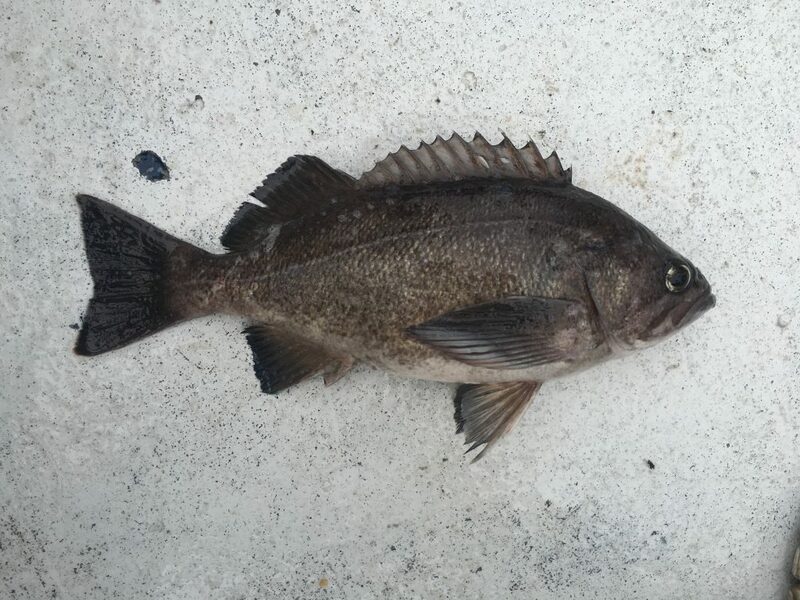 Its coloration was dark brown/gray, just like a Black Rockfish. Second, the head was wrong for a Black. It was striped like a Blue. Only the stripes were very faint. Third, the fins were blue. At least, the ends of the pelvic and pectoral fins were. Fourth, but then again, with the mouth closed, a Blue’s jaws should be even, and the bottom jaw of this fish was victim of the underbite found in Blacks. It was tied, but the deckhand told me it was just a variant of Blue Rockfish. I wasn’t convinced and recorded it as a “Black/Blue Rockfish Hybrid” in my journals. I caught three more in the time it took for them to be identified as their own, unique species, recording each one as “Black/Blue Rockfish Hybrid” in my increasingly digital records. That wasn’t the first time my identification had been corrected, resulting in a new species, but it remains the only time a species I’d already caught became a species new to science. In the Fall of 2017, I got a Deacon just over two pounds with Tidewinds Sportfishing, thanks to Captain Levi Schlect that will be a world record if I submit it. I saved the line sample, had multiple pictures and witnesses, but I just don’t know if a Deacon of that size is worth the hassle for a record? I rewrote this story later for a column. Read it here. Read the next entry in #SpeciesQuest here: Species #40 — Striped Seaperch.